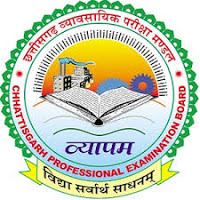 CGvyapam Jobs Recruitment Notification 2018.Chhattisgarh Professional Examination Board CGvyapam inviting applications for the positions of Data Entry Operator, Steno Typist, Multiple Vacancy.Interested and Eligible candidates can apply for the positions. Candidates must have completed the 10th with Diploma or 12th and Diploma/Certificate in DEO/Programming, Shorthand or its equivalent with good marks from a recognized Board/University / Institution. Selection will be based on the basis of their performance in Written Exam, Merit List/Skill test that will be conducted by selection committee of recruiting organization. Starting Date of Online Submission of Application Form Is: 07-08-2018. Online Application Will Be Received Till : 04-09-2018. Commencement of Downloading Admit Card Is : 24-09-2018. Date for Written Examination : 30-09-2018.